I'm excited to tell you about this new workbook by Amanda Bell! The Sermon Notes Journal for Ladies was just published this Fall and I love it. 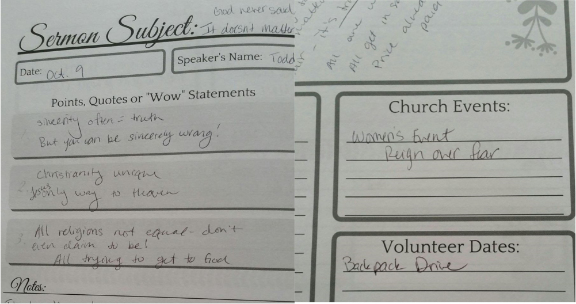 Have you ever used a journal for your church notes? This was my first time working in an organized book and I really appreciated it. I love the beautiful cover and inside design. The journal is the size of a workbook with plenty of room to write and scribble your notes. Good thing, because I am not always a pretty note taker! 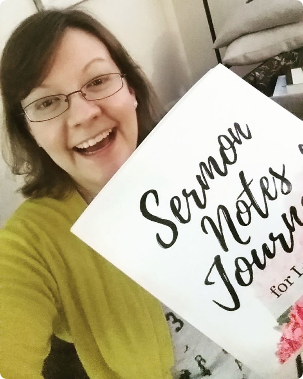 The workbook starts with your Sunday sermon notes And here is my favorite part: It has a place for your other church reminders as well! Write down your volunteer or church events all in one spot! I really appreciated this thoughtful addition. The Sermon Notes Journal for Ladies is well thought out, beautifully designed and just what I was looking for. Stepmoms, I know weekends are hard and crazy busy. We have kids going back and forth, lots of emotions flying around our homes. And we need to remember to fill our cup with Jesus so we don't get lost in that mix. I found this journal to be a little something special just for me and a helpful tool to keep me focused during church and on into the week.